Mamoudou Gassama displays a certificate of courage and dedication. (Left) Scaling an apartment building to save a four-year-old child dangling from a fifth-floor. 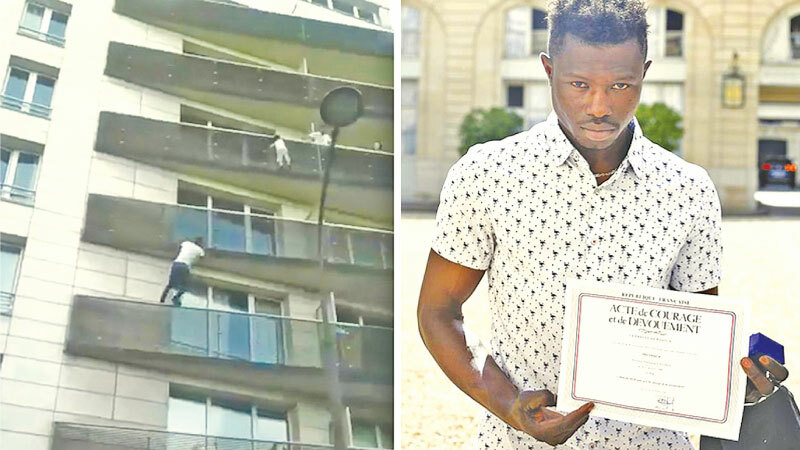 FRANCE: The migrant hero nicknamed “Spiderman” for saving a child hanging off a balcony by scaling a Paris apartment block with his bare hands has become a French citizen, according to a government decree. Nimble 22-year-old Mamoudou Gassama from Mali was granted a fast-track to French nationality and a job in the fire service after the daring rescue in May. “This act of great bravery exemplifies the values which help unite our national community, such as courage, selflessness, altruism and taking care of the most vulnerable,” said the official document published Wednesday. Gassama, who had been in France illegally, was catapulted to global fame by the extraordinary feat captured in footage seen by millions on social media. The video showed the former construction worker jumping from one floor to the next, hauling himself up with impressive athleticism towards the four-year-old boy dangling above. He was congratulated in person by President Emmanuel Macron two days later and also met Mali’s President Ibrahim Boubacar Keita in the capital of the West African country. Gassama arrived in France in September 2017 after travelling the perilous Mediterranean migrant route and found a job in the construction industry despite not having the right to work. He has received international acclaim for his bravery but activists have accused the French government of “hypocrisy”, pointing to its treatment of other migrants. In August a controversial asylum and immigration bill was signed into French law, designed to accelerate asylum procedures by cutting the maximum processing time. The new law was passed despite opposition on the left which decried an effort to limit arrivals while the far right saw the measure as not going far enough.